WARNING: This product can expose you to chemicals including Di(2-ethylhexyl)phthalate (DEHP), which is known to the State of California to cause cancer, and Di(2-ethylhexyl)phthalate (DEHP) and Bisphenol A (BPA), which are known to cause birth defects or other reproductive harm. For more information go to www.P65Warnings.ca.gov. 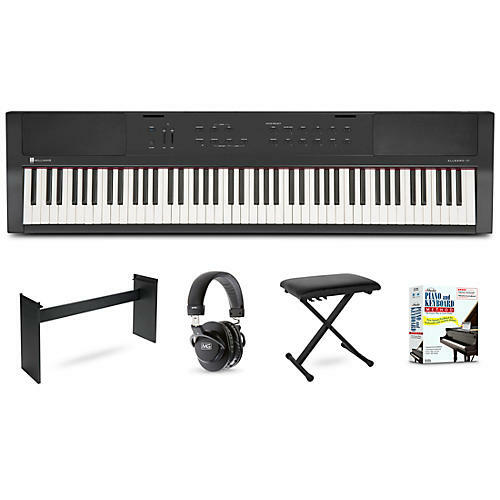 This home piano bundle gives you the Williams Allegro III packaged a wooden keyboard stand, padded bench, a pair of studio headphones and an instructional piano method book. The Williams Allegro III is an 88 weighted-key digital piano with superior sounds and breakthrough features that are ideal for the advancing student or the professional player who appreciates nuanced key control and high-quality sound. Taken from the Williams Custom Sound Library, it features 10 high-resolution sounds including Pianos, Electric Pianos, Organs, Strings and Bass, recorded using the finest instruments in the world with full dynamic ranges. The newly improved, weighted piano-action keyboard, allows for quick, responsive feel and control over the entire key range. The dual-driver speakers deliver all those lush tones with outstanding clarity and volume. Bluetooth MIDI functionality connects the Allegro III wirelessly to your iPhone or iPad to run iOS apps such as educational software like the McCarthy Music Teaching app. Plus, the Williams iOS app provides easy access to your Allegro III for adjusting sounds and controls as well as other features to improve your keyboard skills. The Allegro III can run on batteries or with the included AC power supply. Now you can give your Williams Allegro Plus keyboard a more elegant look and feel with a luxurious Williams AS1 Plus keyboard stand. Ideal for studio, home or office, it features a sturdy H-frame design with a striking matte ebony finish that seamlessly matches your keyboard and provides a stylish, modern touch that complements any décor. The AS1 Plus can be assembled quickly and attached to your Allegro2 in minutes. It comes complete with an easy-to-follow assembly guide, all fasteners, and a direct number to Williams customer service agents who are always eager to help. The Musician's Gear Deluxe Keyboard Bench is an X-style folding throne that features supreme comfort from heavy padding and great stability from rubber foot stabilizers. The height is adjustable from 21-1/4" to 25-3/4" and it is 23-3/5" wide. eMedia Piano and Keyboard Method 3.0 offers everything you need to learn how to play keyboards. The instructional software showcases Piano instructor Irma Irene Justicia, M.A., who has taught at the renowned Juilliard School of Music. Ms. Justicia guides you through over 300 step-by-step full-screen piano lessons. The eMedia learning software's Instant Feedback feature works with both electronic keyboards and acoustic pianos. It listens as you play melodies and shows whether you're playing correctly. The piano and keyboard lessons start with the basics, such as hand position, rhythm, and playing on black keys, and move on to reading music notation, sight reading, scales, and much more. Techniques are demonstrated with over 70 videos viewable in full-screen mode. Musicians Gear MG900 are circumaural headphones designed for playback, monitoring, and recording. With a lightweight 40mm neodymium driver, soft leatherette earpads and versatile hinge design, the MG900SH offers extended frequency response, hours of comfort, and easy storage and handling.